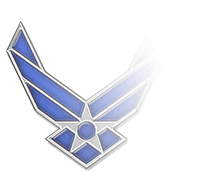 Established in 1950, the Armed Forces Reserve Medal (AFRM) is awarded to members of the Reserve Components of the U.S. Armed Forces who have logged ten cumulative years of honorable military service within a twelve-year time span. 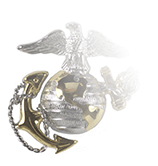 Time spent when called up for active duty does not count toward that ten-year minimum, but neither does it count as breaking the twelve-years of consecutive service. 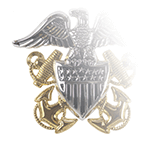 The AFRM is the successor to both the Marine Corps Reserve Ribbon and the Naval Reserve Medal, which were “grandfathered” until 1967 and 1958 respectively. 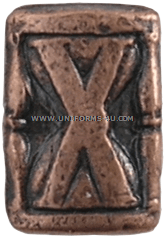 Until 1996, a bronze hourglass device was presented to indicate the wearer had earned a second or subsequent AFRM; an AFRM with two bronze hourglasses would indicate the wearer had served honorably for at least 30 years in a Reserve component. But the regulations were altered so that the bronze hourglass device, officially referred to as the 10-year-device, was issued upon completion of the first ten-year service period. Also, the design of the device was modified so that its color would indicate at a glance the wearer’s length of qualifying service. Rather than receiving two bronze hourglass devices to indicate the achievement of two ten-year service periods, recipients are now awarded a single hourglass device; gold hourglass devices indicate completion of three ten-year service periods in the Armed Forces Reserve. 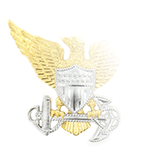 The hourglass device is also worn on the Coast Guard Auxiliary's Sustained Auxiliary Service Award. 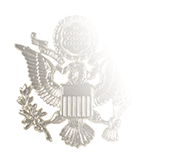 Bronze is worn to reflect a cumulative total of 7,500 volunteer hours, Gold for 15,000, and Silver for 25,000 or more. No additional devices are worn to reflect accumulation of hours above the 25,000 mark. Only one hourglass device is worn at one time, e.g., an Auxiliarist with 17,000 volunteer hours would wear only the Gold hourglass instead of both the Bronze and Gold hourglass. Learn more about the Armed Forces Reserve Medal and Ribbon by visiting our AFRM Web page.